Please see our Boar & Sow pages for pictures of parents. When I first started breeding, it did not take me long to realize the importance of record keeping - not only for myself but also for my buyers. 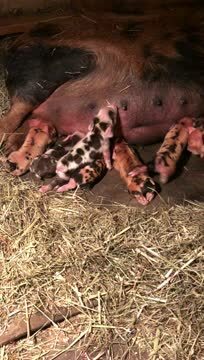 I came up with the idea of a form that all information would be kept on for each individual piglet - both breeding piglets and pet piglets. It took me many different drafts of my “Take Home Form” to get it to where I was satisfied. There are still changes that I am making for the next time the forms are printed. The forms are carbon paper - one for me and one for my buyer. This “Take Home Form” also serves as my contract for both new piglets and pigs that are being transferred. This form has all the pertinent information needed for me, the seller to register the pigs. The form gives buyers the information they will need for feed, shots, heat lamps, to run COI’s etc. 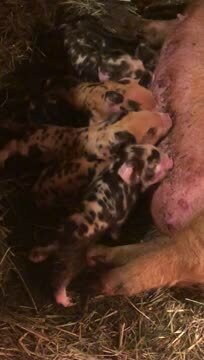 When a litter is born, I start a new form for each piglet. If I have a piglet that passes away I mark the form accordingly. As each piglet sell and has a depositor, I email this form filled out and continue to add to the form until the pig goes home with the original client portion of the form. I can not tell you how many times this form has truly saved me time and helped me be as organized as possible. I use this form to keep all of my vaccination and DNA records so it is super easy to know which piglet has had what and when. I attach one of the labels that comes with each microchip to this form - this is very useful in identifying piglets easily when you have piglets that look similar. When I register or transfer the pig, this form has everything that I need to do the registration papers correctly and it definitely saves a lot of time having everything in one place and on one piece of paper. I have also used this form with existing clients to run COI’s with currently owned piglets to new ones I have for sale. © 2019 WELCOME TO RED ROOF KUNEKUNES. All Rights Reserved.